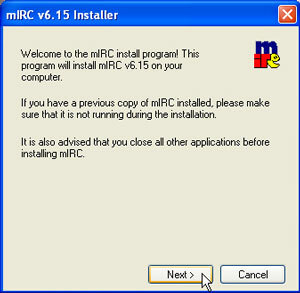 The following assumes you wish to join us using mIRC (http://www.mirc.com/install.html). If you wish to join us using another chat program keep in mind the steps will be different but the commands should remain the same. Now it's time to enter some details. Full Name: Put anything, doesn’t have to be your name. 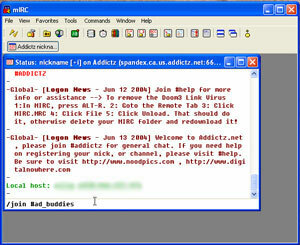 Email Address: You do not need to enter a real email address here if you don't wish to. Nickname: Choose a nickname that you will use to chat as. Remember most of the common names will already be taken. Alternative: This is in case the chosen nickname is taken. Try thinking of a second option. 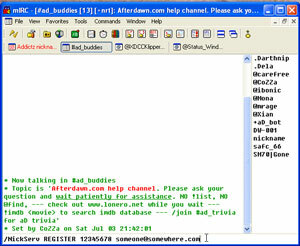 Down the bottom of the screen, in the box, type /server irc.freenode.net. This will connect you to the ICQ Network, where #team_seti.usa is located. 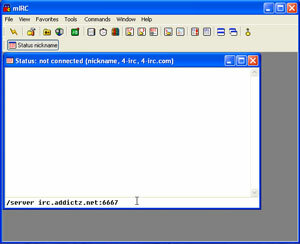 mIRC will then connect to the ICQ server; you should then see a similar screen to the one on the right. Now it's time to join the #team_seti.usa channel. You do this by typing /join #team_seti.usa. Then Press Enter. Now you should be in the team_seti.usa channel. Ok, now its time to register your nickname so nobody else can take it. 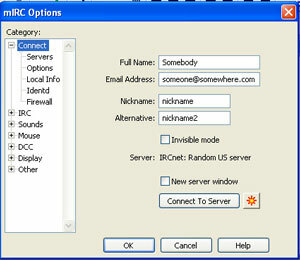 This can be done by typing /NickServ REGISTER PASSWORD EMAIL. Password, being a password that you will remember. Email, Please use a valid email address, otherwise you will not be able to retrieve your password if you forget it, or some servers require email activation. Now, we will add it to Auto Identify, so that everytime you connect you don’t have to type it. This can be done by clicking Tools -> Options -> then find Connect, then under Connect, click Options, then select perform. You should now see the picture on the right. 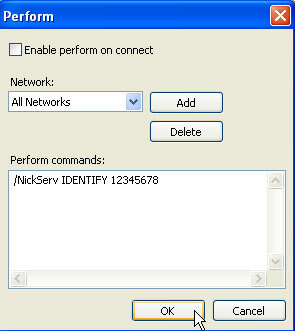 Now type in /NickServ IDENTIFY PASSWORD. The password will be the password that you used while registering the nick. Now you should be connected to #team_seti.usa on the ICQ network. Type your message in the box at the bottom of the screen, and wait for a reply. Just remember, that people aren’t in there all the time. So just sit back and wait for a reply.